Does Hike have what it takes to win the mobile messaging battle? New Delhi/Bengaluru: Like in e-commerce, India has become the last major battleground for the Chinese and American technology giants in the mobile messaging business, with China’s Tencent Holdings Ltd backing local start-up Hike Ltd against the might of Facebook Inc.-owned WhatsApp. Hike said on Tuesday that it received $175 million at a valuation of $1.4 billion from Tencent, Foxconn Technology Co. Ltd and existing investors, SoftBank and Tiger Global Management. Hike, at present, is a distant third to WhatsApp and Messenger, also owned by Facebook, in the pecking order of messaging apps in India. Investors are betting that while Hike may not be able to catch up with Facebook’s two messaging apps in terms of the number of users, the local app will differentiate itself by offering games, content and other hooks to please users. In this sense, Hike’s product is more inspired by Tencent’s QQ and WeChat apps, which offer a complete ecosystem of games, content, commerce and messaging and enjoy a near-monopoly in China, rather than by WhatsApp and Messenger, both of which are pure messaging platforms. Hike’s performance will determine whether India will turn out to be a winner-take-all market like China or whether the country will look more like the US, where the market is split among several apps including Messenger, Line and Snapchat and no app is particularly dominant. Industry experts said that if Hike can offer enough use cases apart from just messaging, then it may succeed in building large business despite the growing popularity of WhatsApp. “Hike’s differentiation is currently non-trivial. For instance, Line is all about content, stickers; WeChat is a complete ecosystem; Snapchat has a clear proposition. If Hike has to succeed in India it will have to create a differentiated identity," said Abhishek Goyal, co-founder at Tracxn, a start-up research firm. 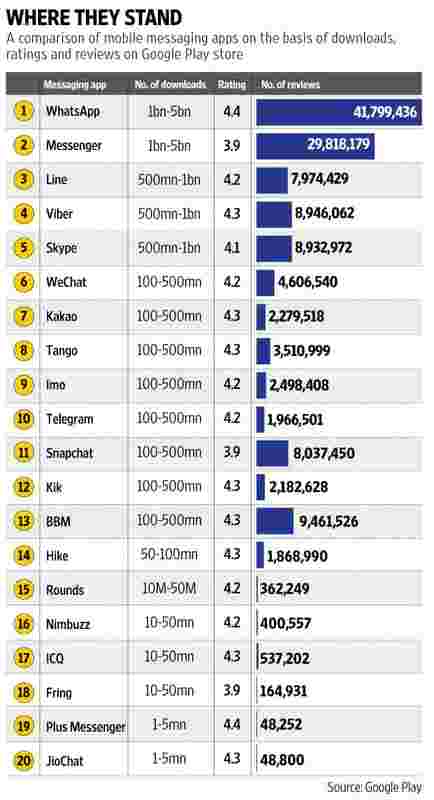 Messaging apps across the world, including Snapchat (in the US) and Momo (in China), are attracting high valuations, which is backed by a simple theory: as people increasingly spend more time on their smartphones, mobile messaging will become the de facto communication channel. In July, Japanese firm Line Corp. raised over a billion dollars in an initial public offering on the New York Stock Exchange and Tokyo Stock Exchange. US-based messaging service Snapchat will reportedly be valued at about $20 billion when it raises its next round over the next few months, according to a TechCrunch report. Hike, which was launched in December 2012 by Kavin Bharti Mittal, son of billionaire entrepreneur Sunil Mittal (chairman of Bharti Enterprises), enjoyed an initial burst of popularity with smartphone users and became one of the most popular messaging apps in India within a year. Over the past two years, however, it’s been overtaken by Facebook. According to a study by research firm TNS, released in October, WhatsApp emerged as the most popular messaging app among Indian Internet users, followed by Facebook Messenger. While the survey isn’t definitive—its sample size was 5,306—there’s little doubt WhatsApp is currently the most popular messaging app in the country. Hike, which counts youngsters in the age group of 15 to 24 as its core customer base, is trying to come up with use cases as varied as its privacy features, content, gaming and messaging on pre-paid Internet packs. Hike claims to have 100 million users on its platform but does not disclose the number of active users. The Google Play store shows 50 million downloads for the app. WhatsApp has about 100 million active users in India. “Once you realize that for us to win, WhatsApp doesn’t have to lose, the whole perspective changes. Now, data shows us that we sit side by side with WhatsApp. People use Hike as much, they do different things with different people in different apps. The kind of stuff you can do on Hike, you cannot do on WhatsApp. We’ve large amount of people using Hike alone, but an even larger amount people using both Hike and WhatsApp," said Kavin Bharti Mittal, founder and chief executive of Hike in an interview. Mittal claims that Hike is No.2 in India on the basis of user engagement. “If you see engagement per user, we are by far No. 2 after WhatsApp," he added. Hike has always been portrayed as the WeChat of India and offers curated content and gaming services to differentiate itself from WhatsApp. And with Tencent now backing Hike, the company is expected to benefit from the knowledge share and technology collaboration between the two. Mittal denied that there has been any discussion regarding a merger or a strategic partnership between the two.